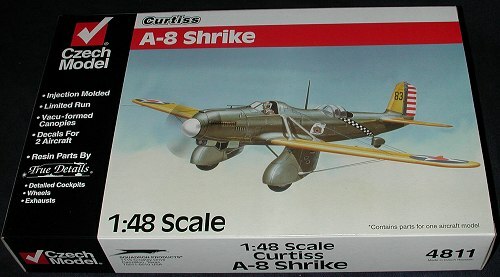 The Curtiss A-8 Shrike was ordered in 1930 in response to a need for an all-metal attack aircraft to serve with the USAAC. Curtiss provided a low wing monoplane with fixed landing gear and a braced wing. It was powered by the ubiquitous Curtiss V-1570 Conqueror, a twelve-cylinder liquid-cooled engine that produced 600 hp. The prototype was delivered in 1931. It was able to carry up to ten 30 lb bombs and had four .30 caliber machine guns; two in each wheel spat. A fifth weapon was on a flexible mount for the rear gunner. It was relatively fast for the time with a top speed of near 200mph. Range was just under 500 miles, but that would have been with full fuel and a light load. 13 aircraft were ordered; five of them being YA-8 and the next eight being Y1A-8 aircraft. In effect, they were all preproduction aircraft. With money being very tight due to the Depression, it was the best the Army could do. Once they entered squadron service, 11 of the aircraft were redesignated simply as A-8s. They provided faithful service throughout the 1930s and were eventually relegated to flight training an maintenance training duties. It is unknown if any of them survived to be put into museums. The first thing you will notice is that Czech Model has gone to full color on their boxes. It is the same box, but now there is a full color cover and on the back is a full color paint and markings guide. Open it up and what you find is your standard MPM-type of kit. The basic airframe is provided in very nicely done injected plastic with engraved panel lines, while the interior and all the 'fiddly bits' are done in resin. Inspection of the injected parts for deformities showed sink areas in the wing braces, the covers for where the flying wires enter the spats, and another sink area along the rear of the upper wings. Filler will cure all, but some detail may be lost during the sanding process. Resin makes up the majority of the parts. The resin is well cast in a light buff material and appears to be free of any deformities. Even though all the bits were in one bag together, none of the finely done bits had broken off, a rarity! 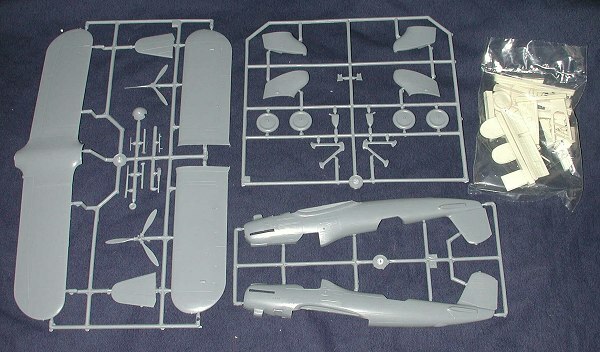 The parts in resin are all of the two interior cockpits along with the exhaust, flap and aileron actuator assemblies, guns, radiators, entrance steps and upper wire fairings. A set of resin wheels is provided as a replacement for the plastic ones, so the builder does have a choice. There are two sets of vacuformed canopies and they are nicely done. It is always appreciated when a second set of vac bits is provided, even though they may not be used. Probably the most difficult part of this kit will be the rigging. Not because of the rigging itself as it is fairly straight-forward, but because of the small wire braces that will have to be made. They are shown in the instructions as just laying on the wires, but we know that they need to be drilled so the wires can run through them. These will also have to be made by the builder. The plates where the wires go through the wings are clearly marked so it is a simple matter of drilling through the center of them when rigging. Instructions are quite good and provide a logical construction sequence. Any notes or color information is provided as needed. One thing you may wish to do is to cut out the small windows in the rear cockpit fairing. They are molded solid and opening them will improve the appearance of the model. 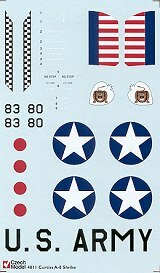 Markings are provided for one squadron; the 37th attack squadron at Langley Field in 1934. aircraft numbers for two planes are provided. With its OD fuselage, yellow flight surfaces and red/white/blue rudder, it makes for a very colorful aircraft. Decals are very well printed and appear to be quite thin. I'm guessing Propagteam or similar as if they were Microscale, it would be printed on the sheet. It is about time that aircraft of the 1930s are being recognized as valid subjects for kits. The 1/72 crowd has had quite a head start with some very nice kits and I'm really hoping that the 1/48 gets its share of attention. I've always liked 'yellow wing' aircraft and have already started building this kit. Stay tuned!